Carl Wood Auctioneers is a family owned and operated business where friends and family come together working for the needs of the community. 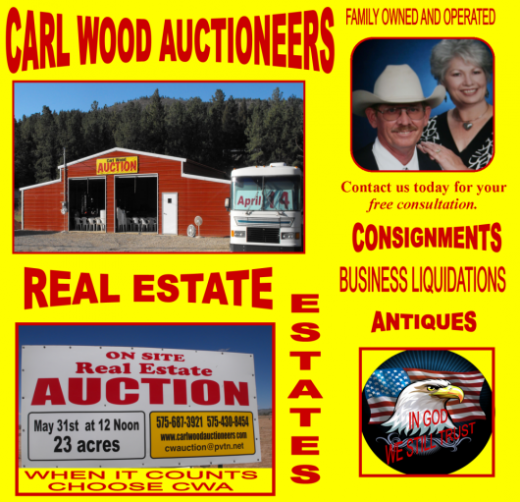 Carl Wood Auctioneers specializes in consignments, Antiques, estates, business liquidations and real estate. Carl also donates his time and talents to benefit auctions several times a year he also is available for fundraisers for churches, schools and civic organizations . CARL WOOD AUCTIONEERS CONDUCTS REAL ESTATE AUCTIONS IN NEW MEXICO, ARIZONA, CALIFORNIA, NEVADA, COLORADO, OKLAHOMA AND TEXAS. 60 + HOMES 8 MILLION IN VALUE. AND HOME OWNERS, SPECIALIZING IN REOS, FSBO, BUSINESS LIQUIDATIONS & ESTATES. Carl & Debbie thank you for your expertise and professionally handling our items. Will definitely will ask you to handle the other items we will have, Thank you, job well done. We have not missed a Carl Wood auction in months. There are always good deals and laughs! I have known Carl and Debbie for thirty years and they are truly people of integrity, and are some of the hardest working people you will ever meet! You can trust them to deal fairly and honestly with you at all times! Hello Everyone, we look forward to 2019 Auction sesson. We've missed seeing all our valued auction customers and friends! Our first auction of the sesson will be April 6, 2019. Don't miss it! We look forward to seeing you all!! I wish to take this opportunity to thank you for handling the auction for my sisters estate. I was pleased with professional way that it was handled. It was such a relief to me that everything was sold an I did not have to dispose of anything. I feel that a complete auction was the best way to handle the estate. Contents © 2019 Carl or Debbie Wood • Site Provided By: Day One Web, Inc.